With the A3X, ADAM Audio present their smallest monitor to date, making it perfectly suited for all environments where space is limited but sound shouldn’t be constricted. The A3X combines a tiny footprint with the much acclaimed ADAM sound quality by using the X-ART tweeter for the higher frequencies, a guarantee for crystal clear music reproduction. A 4.5” (basket) driver handles the lower registers. The diaphragm is made from carbon fiber, a material that is very light but very stiff and therefore capable of delivering colouring-free sound. Two built-in 25 Watt amplifiers powers each of the drivers directly. A very handy and exclusive technology found in the two smaller AX monitors is the Stereolink. This is accomplished by a pair of additional RCA connections that allow for a bypass of the second stereo channel to the other speaker. This new technology connects two A3X speakers in such a manner as to allow the user the option to control the overall stereo volume of the system from either speaker’s gain control. This makes the A3X a natural for “mixer-less” desktop applications where overall system volume needs to be adjusted easily. The front of the A3X sports dual ports for surprisingly low frequency response down to 60Hz. The front panel also has power and gain controls. 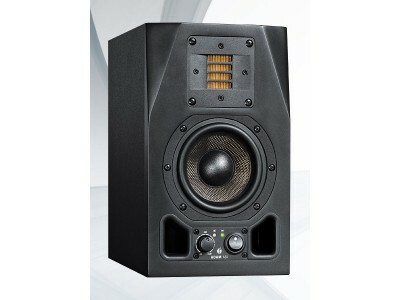 The rear panel includes a tweeter gain control as well as balanced (XLR) jacks and unbalanced (RCA) jacks, allowing for greater connection flexibility. There are also two M6 (6 mm) metric screw threads for stand/wall mounting. "I’ve used various monitors for my computer work before, but never of the caliber of the A3X series. Before these, I would have to redo my mixes significantly when transitioning from the small cheapies to the big 'real ones'. 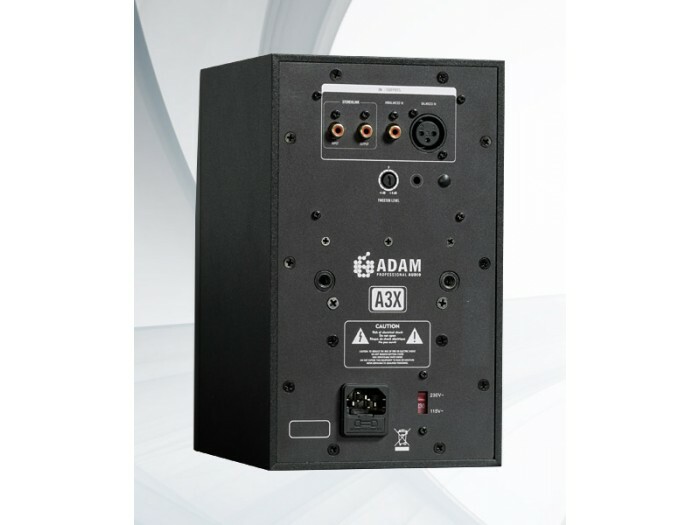 The ADAM Audio A3X’s save me a step by providing both great sound in a compact format and by changing mundane audio task-work into a quality listening experience. If you use good monitors from the outset, you’ll learn your music that much faster so that when it comes time for mixdown and mastering on your big boxes, you’ll already be acclimated to your song’s subtler sonic aspects—aspects revealed only by the A3X’s with their sweet, smooth top end, and impressive handling of bass frequencies. Highly recommended." Review: "...one of the best compact monitors"